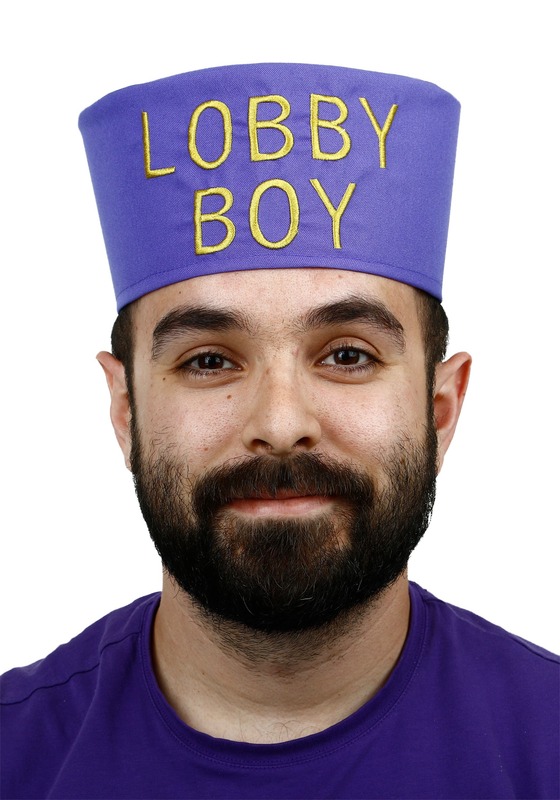 "A lobby boy is completely invisible, yet always in sight"
Hey! You've got a job! And at that famous historic hotel, no less. Everyone needs to know that you've got a job and what you do. This purple hat is tall and has gold lettering that proudly proclaims your position. You're going to do a great job, we're sure of it! You'll be the concierge's go-to man. Your Lobby Boy costume wouldn't be complete without this Pill-Box hat! Remember to great all your guests while you're dressed in full uniform with a smile on your face and maybe a fake little pencil mustache over that smile. Maybe you're starring as a frantic bellboy in a play. Maybe you're going hike around a pile of suitcases for Halloween, that should be super interesting! Whatever you're up to, there will be no doubt as to what your job is.